On 8 November, in a dramatic nationally televised speech that I watched in my room in North Block, the prime minister announced that the top two high-denomination currency notes of ₹ 500 and ₹ 1,000 would cease to be legal tender; that is, they would no longer be accepted as a government-certified means of payment. It was an unprecedented move that no country in recent history had made in normal times. The typical pattern had either been gradual demonetisations in normal times (such as the European Central Bank phasing out the €500 note in 2016) or sudden demonetisations in extreme circumstances of war, hyperinflation, currency crises or political turmoil (Venezuela in 2016). The Indian initiative was, to put it mildly, unique. It presupposed an extraordinary amount of resilience in the economy, especially amongst the vulnerable, because it was going to be the first of two major shocks—along with the GST—to affect those in the cash intensive, informal sectors of the economy. Two years on, Demonetisation still consumes the attention of the commentariat, in part because of the mysteries surrounding its origins. I have little to add to the economics of the D-decision beyond what was said in three economic surveys that I oversaw. I do have some new thoughts, or rather hypotheses, on two demonetisation puzzles, political and economic. Why was demonetisation so popular politically if it imposed economic costs? Specifically, why did demonetisation turn out to be an electoral vote winner in the short-term (in the Uttar Pradesh elections of early 2017) if it imposed so much hardship on so many people? Today, the political perception of demonetisation is confounded by a slew of economic and political developments that have occurred since November 2016. Clearly, many factors influence voters’ perceptions and hence affect outcomes, rendering any attempt to tease out cause and effect as unreliable. It is important, however, not to forget history as it happened. At the time (early 2017), the election in Uttar Pradesh—India’s most populous state and the world’s eighth-largest ‘country-that isn’t’—was widely seen as a verdict on demonetisation, arguably the salient policy action of the government, personally and forcefully articulated by the prime minister. 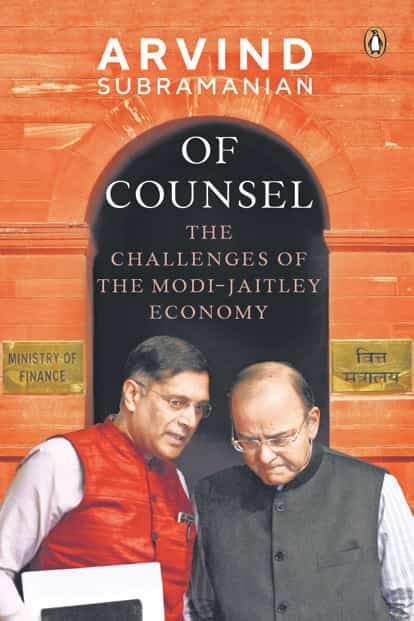 ‘Of Counsel: The Challenges of the Modi-Jaitley Economy’: By Arvind Subramanian, Penguin Random House India, 229 pages, ₹699. The demonetisation experiment speaks to the more pervasive and fascinating global phenomenon of What’s the Matter with Kansas?, the title of a famous book by American historian Thomas Frank. This book explores the apparent paradox of citizens voting against their economic self-interest. For example, why do poor white males vote for the Republican Party and President Trump when the policy agenda either has no benefits to them (tax cuts for the rich) or is positively harmful (undermining Obamacare and welfare benefits more broadly)? That same question seemed relevant after the resounding victory of the NDA government in the UP election. This particular piece is an attempt to understand that result as a disinterested observer armed only with publicly known facts. It is not an explanation of the motives of demonetisation, simply a post facto analysis of one apparently fascinating political outcome associated with it. How could demonetisation that is supposed to have adversely affected so many Indians—the scores of millions dependent on the cash economy—be so resoundingly supported by the policy’s very (and numerous) victims? I offer the controversial hypothesis that imposing large costs on a wide cross-section of people (and the fact that the ₹ 500 and not just the ₹ 1,000 note was demonetised increased the scope and scale of demonetisation’s impact), unexpected and unintentional though it may have been, could actually have been indispensable to achieve political success. The canonical political economy model of trade explains the persistence of protectionism in terms of an imbalance between the gainers and losers. Protection—which raises domestic prices—helps a few domestic producers a lot while diffusing the harm among many consumers, each of whom loses only a little. Producers, therefore, have both an incentive and ability to lobby for protection, while individual consumers have little incentive to lobby against it. The demonetisation case has been very different: hardship was imposed on many and possibly to a great extent, and yet they appear to have been its greatest cheerleaders. One answer to the demonetisation puzzle has been that the poor were willing to overlook their own hardship, knowing that the rich and their ill-begotten wealth were experiencing even greater hardship: ‘I lost a goat but they lost their cows.’ In this view, the costs to the poor were unavoidable collateral damage that had to be incurred for attaining a larger goal. This is not entirely convincing. After all, the collateral damage was in fact avoidable. Anti-elite populism, or ‘rich bashing’, as the Economist put it, could have taken the form of other punitive actions—taxation, appropriation, raids—targeted just at the corrupt rich. Why entangle the innocent masses and impoverish them in the bargain? As I wrote in the Economic Survey of 2016–17, if subsidies are a highly inefficient way of transferring resources to the poor, demonetisation seemed a highly inefficient way of taking resources away from the rich. Understanding the political economy of demonetisation may require us, therefore, to confront one overlooked possibility—that adversely impacting the many, far from being a bug, could perhaps have been a feature of the policy action. Not necessarily by design or in real time, but in retrospect it appears that impacting the many adversely may have been intrinsic to the success of the policy. Consider why. First, the breadth of impact could have been a credibility signalling device. The American economist Thomas Schelling famously argued that to convince the public or opponents of the credibility of one’s actions, costs must be incurred. It cannot be done cheaply. Hernan Cortes, the first conquistador, is said to have destroyed all his ships after landing in Mexico to motivate his fellow soldiers to fight boldly because there was no possibility of return. By imposing near-universal costs, demonetisation could similarly have been a device to signal regime change against black money in particular, and the corrupt rich, more broadly. If a regime could incur such enormous costs, it could surely follow up through similar actions against corruption. Indeed, to demonstrate that the measure was bold and hence more likely to be effective, the felt costs may have had to be high. Second, the breadth and depth of impact could have served as another signalling purpose. In order to be credible, the masses must somehow be led to believe that the corrupt had been hurt. With demonetisation, this may not have been easy to do, at least in the short-run. How better to convince the masses that the corrupt rich were being hit hard than to hit hard the masses themselves? ‘If it hurts me so much, it must hurt the rich immeasurably more’ could have been the thought process of the typical victim. Third, the near universality of impact created a sense of solidarity. Sparing some groups would have undermined this spirit and raised questions about the good faith and legitimacy of the policymakers, who could have been seen as favouring some while hurting others. If only a few had been adversely affected in the demonetisation process, they would have mobilized and from trade theory we know that their incentives to do so would have been great. Moreover, if only a few had been affected, suspicion would have arisen about those who were spared: did they have connections? Were they possibly even ‘in’ on the decision? Did they contribute as quid pro quo for being spared? By impacting the many, these difficult decisions were avoided. In the light of the zeitgeist of stigmatized capitalism, such questions would invariably have been raised and would have been politically awkward. Fourth, and a related point, is cultural. One legacy of Mahatma Gandhi was to inculcate a spirit of sacrifice as a necessary condition for achieving a larger, loftier objective. Especially if there is a shared recognition that eliminating black money is not an easy task because it has been around for 70 years, the need for sacrifice—and shared sacrifice—could only be enhanced. None of the points I’ve raised here is a normative assessment of the economics and politics of demonetisation. But honesty requires admitting that the political response to demonetisation was puzzling, and confounded most economists and political scientists. So we must be open to the hypothesis that politically speaking, in the case of demonetisation, vice may have been virtue. Why didn’t the draconian 86% reduction in the cash supply have bigger effects on overall economic growth? To put this more provocatively, the question was not whether demonetisation imposed costs—it clearly did—but why did it not impose much greater costs? Demonetisation was a massive, draconian, monetary shock: in one fell swoop 86% of the currency in circulation was withdrawn. Real GDP growth was clearly affected by demonetisation. Growth had been slowing even before, but after demonetisation the slide accelerated. In the six quarters before demonetisation growth averaged 8 % and in the seven quarters after, it averaged about 6.8% (with a four-quarter window, the relevant numbers are 8.1% before and 6.2% after). I don’t think anyone disputes that demonetisation slowed growth. Rather, the debate has been about the size of the effect, whether it was 2 percentage points, or much less. After all, many other factors affected growth in this period, especially higher real interest rates, GST implementation and rising oil prices. I do not have a strongly backed empirical view apart from the fact that the welfare costs, especially on the informal sector, were substantial. As a monetary economist, though, what is striking is how small the effect was compared to the magnitude of the shock. There are many ways of seeing this. Compare what happened to cash with what happened to nominal GDP. It is a stunning picture. Prior to demonetisation, cash and GDP move closely together. Then, currency collapses and recovers (the dotted line), but through all of this, the economy seems to have been chugging along almost unmindful of the currency in circulation. You have to squint to see any downward movement of nominal GDP after demonetisation: in fact, there isn’t, and all the downward blips reflect seasonality, which leads to a lower level of activity in the first (April–June) quarter every year. What could possibly explain this apparent resilience? A number of hypotheses need to be considered. First and foremost, it could simply be an artefact of the way that GDP numbers are created. In India, there are no timely measures of informal sector activity, so it is proxied by formal sector indicators. Normally, this is not a problem, since the two move in tandem. But when a shock like demonetisation occurs that primarily affects the informal sector, relying on formal indicators to measure overall activity will overstate GDP. This hypothesis goes only a small way towards explaining the puzzle, since any squeeze in informal sector incomes would depress demand in the formal sector, and this effect should have been sizable. As a result, we need to search for other explanations. One possibility is that people found ways around the note ban, for example by continuing to use the ₹ 500 note even after its use had been formally banned, so the currency shock wasn’t actually as big as conventionally measured. Another possibility is that production was sustained by extending informal credit: people simply agreed to pay their bills as soon as currency became available. Finally, to a certain extent, people may have shifted from using cash to paying by electronic means, such as debit cards and electronic wallets. Or, there may be other, completely different explanations that have eluded my understanding of demonetisation, one of the unlikeliest economic experiments in modern Indian history. Till recently, Arvind Subramanian was the chief economic adviser to the Narendra Modi-led government.